The Huron Township Police Department would like to once again work with deserving children this holiday season with our 5th annual "Shop with a Cop" event. Last year, we were able to provide a Christmas for five Huron Township children. It was truly the best day of the year. Huron Township Police Officers, Township Board Members, Huron School District staff and their families volunteered their time to make this happen. Our goal is to make this the best Christmas for children that other wise may not have one. After seeing our event the last couple years, many residents asked us how they could donate to this wonderful cause. We decided to ask our community partners once again for help in this project. Anything will help. We can assure you that every dollar will go towards Huron Township Children and receipts will be publicly published. 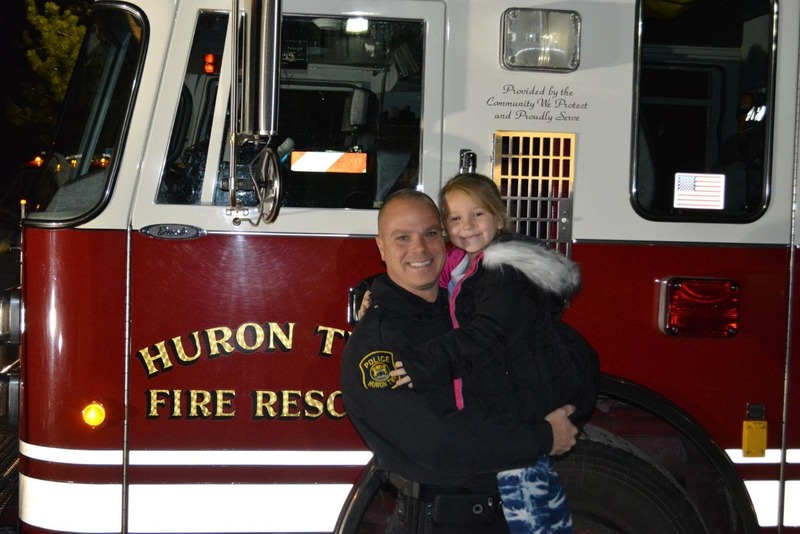 In 2016, the Huron Township Fire Department joined in this great event, essentially making this a night to "shop with a hero." We are proud that they will be joining this effort once again. Last year, each child was paired with a police officer, firefighter and a volunteer. Each child also got a private ride in a police car or fire truck to have a night out shopping. The child also got to turn on the lights and ring the sirens. The goal is to make this happen, not just from the Police and Fire Departments, but from this great community! If we are lucky enough to surpass our goal, the Huron Township Police Department will gladly use extra money help other families in other ways in our community. In that instance as well, all expenditures will be publicly revealed. We were made aware by local school district about a family with 2 young children who had their heat turned off on one of the coldest days of the year. We were able to work with DTE Energy and had their heat restored and paid for through the month of January. Chief Robbins and Brown Principal Cory Pengelly took a 1st Grader from Brown Elementary whose family has been down on its luck on a shopping trip to Meijer. The child was able to purchase all new clothes, boots, hat, gloves. Most importantly he got the Pokémon watch and card set that he had asked Santa for. Huron School Resource Officer Keith Nappo took an 8th Grader from Renton Jr. High to purchase a TV for his bedroom from Best Buy in Taylor. The wonderful employees at Best Buy donated a gift card for the student and his mother to Applebee’s and also threw in a few Blu Ray DVD’s for him to watch on his new TV. We were advised of a mother who needed new tires on her truck to be able to get to work. Some days we are told, her co-workers would have to pump up her flat tires so she could make it home after a long day of work. With the help of her son, after she arrived at work, Officers to her car to Park Tire in Lincoln Park and purchased (4) new tires for her vehicle. When she ended her work day, she was surprised with all new tires on her vehicle. The Fire Chief and Police Chief’s families adopted a local family with (3) kids who were recently evicted from their home. Shopping was done by Lyndsey and Brendan Robbins and with Katlynn Hinojosa. They made the special delivery to the family on. They presented an entire Christmas for a family complete with presents for a Santa visit on Christmas morning. On Christmas Eve, Huron Township Police delivered scooters, toys, and bikes to random kids at businesses within Huron Township. Thanks for reading. Any questions or concerns can be directed to Director Everette Robbins at erobbins@hurontwppd.us.